Frank's work pays off as the Marx family handed over to him a typed draft of the film treatment. This treasure led him to an even more extraordinary discovery, the original handwritten text and sketches from Dali's notebook, stashed away in the Centre Pompidou's archives in Paris. With these notes in hand, Frank, Heidigger, and Pertega have turned the film scenario into a graphic novel. The book starts with a clear explanation of the history behind the movie, how Dali and Harpo met, how they found in each other kindred spirits to admire. Then the curtains are drawn and the movie-graphic novel starts, full of groan-worthy puns, strange dream sequences, and satirical jabs at the business world and its corruptions fed by enormous wealth. It's an odd mix, but the graphic novel format serves the story well. A movie would have entailed complicated sets and imagery, one major reason why the film was never made. But an artist can vividly create the strangest worlds on a mere piece of paper. The magic of two very different temperaments, Dali's and Harpo's, is both jarring and delightful, surrealism delivered with a broad wink and a tip of the cigar, Groucho Marx style. 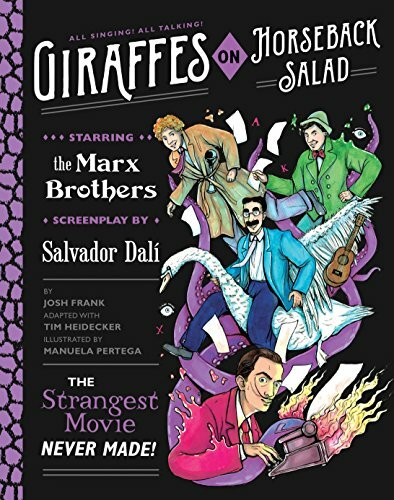 The creative team behind this book have risen to the challenge and created something completely unique: a graphic novel based on a surreal/slapstick film that was never made. That in itself is quite an accomplishment. Dali and Harpo would applaud their efforts.